A warm friendly Yorkshire welcome awaits you at Holmedale, where we will greet you with genuine Yorkshire hospitality and good traditional home-cooked local food. An informal and comfortable relaxing atmosphere is offered during your stay here in the Dales. Holmedale has recently been refurbished to a high standard maintaining a vast amount of original features, including a stunning wood panelled hallway and large spacious rooms, but adapted to meet modern requirements including luxurious en-suite bedrooms, thermostatically controlled central heating. Conforms to all necessary Fire Regulations. offering fantastic views of the village itself, St Oswalds church, and the rolling hillsides of Wensleydale, which are all at your doorstep. Askrigg offers a local shop with tea-room, a cafe, three pubs, a restaurant and a church and is an ideal location to explore the beautiful countryside, attractions, rivers, waterfalls and villages that the dales have to offer. 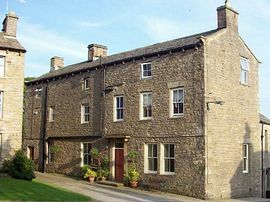 Not to forget Askrigg is also known as "Darraby" in the well known TV Series "All Creatures Great and Small" and is the home of Skeldale House, which was the veterinary practice of James Herriot. We are more than happy to provide a dry space for waterproofs after your long walks and bike rides within the dales and we are able to provide a garage for bikes/motorbikes etc. During your stay, we will be more than happy to help you with any questions regarding the local area and places of interest. Amazing, tasty breakfasts made with local produce. Comfortable, spacious and luxurious rooms. Special Diets Provision: Special diets are catered for. We are happy to cater for any special dietary requirements. Please let us know before your arrival. Parking: There is parking available on the cobbles in front of St Oswalds Church, or in front of Holmedale, just on the road. 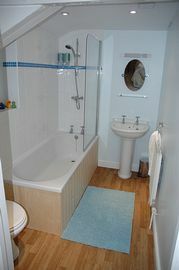 Herriot Room - Double/Twin/Family en-suite: £30.00 per person per night. 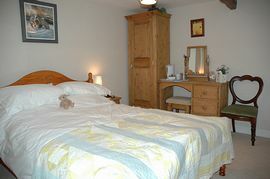 St Oswald's Room - Superking Double/Twin/Family en-suite: £35.00 per person per night. 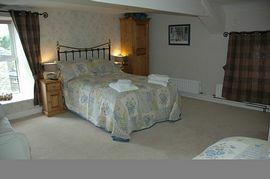 Swaledale Room - Double ensuite: £28.00 per person per night. We are closed 24th/25th/26th December. "Brilliant! We'll definitely be back..... in fact we've already booked it!" "Excellent accommodations!! Charming, comfortable, friendly, a delight! Thanks." "Thank you for making our visit to Askrigg memorable. Wishing you all the very best in your new B&B venture. You deserve to do well. We will be back lovely food, friendly homely stay. Thank you so much." "Thanks for giving us a warm welcome, we have all enjoyed staying in "Holmedale" and hope to return, your accommodation is lovely with a homely feel." 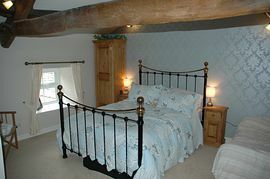 "The nicest B&B we've stayed in, delicious breakfast, lovely room, very welcoming. We'll be back. So, So, perfect!" Silver Award from the English Tourist Board.